Aircel, one of India’s largest mobile service providers, has joined the fight to save India’s Royal Bengal tiger population from extinction. In partnership with Dentsu Communications and WWF India, Aircel has initiated a ‘Save Our Tigers’ project to get the public behind the protection of the country’s national animal. The tiger population has dropped to a current total of 1,411 in comparison to 40,000 tigers a hundred years ago. Aircel is using print, outdoor, online, radio and television advertising encouraging people to not only make donations but join the movement and spread the news. 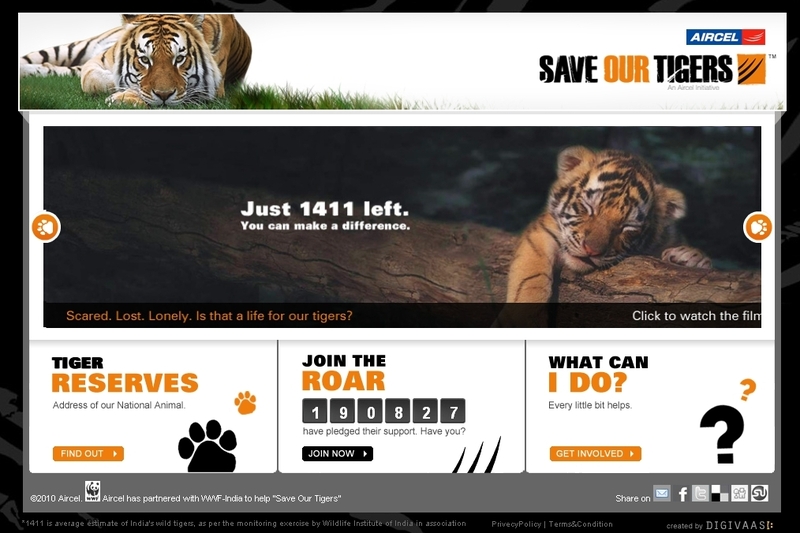 The campaign is centred on the website www.saveourtigers.com as well as on Facebook, Twitter and YouTube. The Save Our Tigers campaign portrays the world as it’s seen through the eyes of a six-months old tiger cub named Stripey by Dentsu Communications. In the campaign’s video Stripey is shown to be waiting for his mother that will never return, probably killed by poachers. Like any child, he’s lost, and hungry. 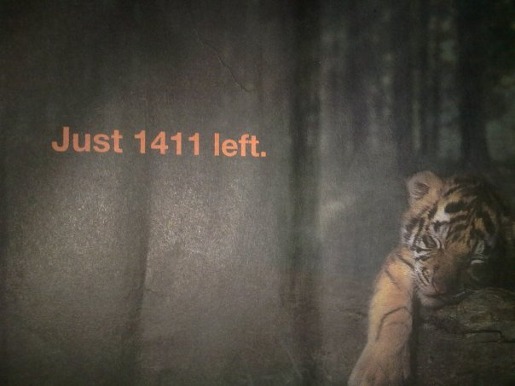 The story of the cub provides a different angle on the poaching problem and provides a connection to the horrifying statistic that there are 1,411 tigers left in India. The commercial ends with a listing of some of the things people can do to help the Save Our Tigers cause. 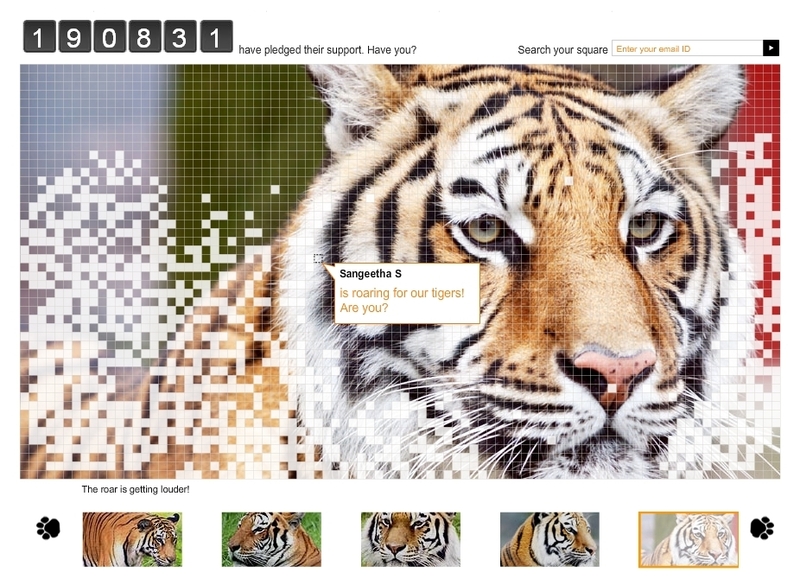 People can join a fun pledging section on saveourtigers.com called ‘Join the Roar’. Participants can pick from a series of tiger pictures, choose a square in a mosaic grid and enter their contact details to fill the piece and complete the photo. So far 190,831 people have joined. The Save Our Tigers campaign was developed at Dentsu Communications by national creative director Shivanand Mohanty, creative director Sangeeta Velegar, art directors Samson Samuel, K. Nagalakshmi, copywriters Sangeeta Velegar, Harish Arora, Mohanarangan. K , concept designers Shivanand Mohanty, Sangeeta Velegar, Samson Samuel. Filming was shot by directors Rickii Kapoor at Cutting Edge, Rajesh Saathi at Keroscene Films and Shiva Shiv at Tellywise. Post production was done at Prime Focus. Indian celebrities behind the campaign are Indian cricketer Mahendra Singh Dhoni, footballer Baichung Bhutia and actors Suriya, Kabir Bedi and Shernaz Patel. Voice-overs are provided by Kabir Bedi and Shernaz Patel.